The Faculty Reading Room is a place for quiet reading, reflection, writing and study. 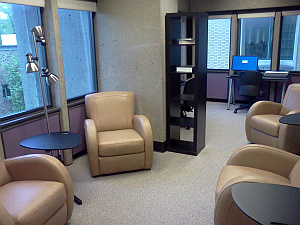 The space accommodates six people, with four armchairs and two computer workstations equipped with scanners. Faculty can check out a key for 4 hours from the 1st floor Circulation Desk.